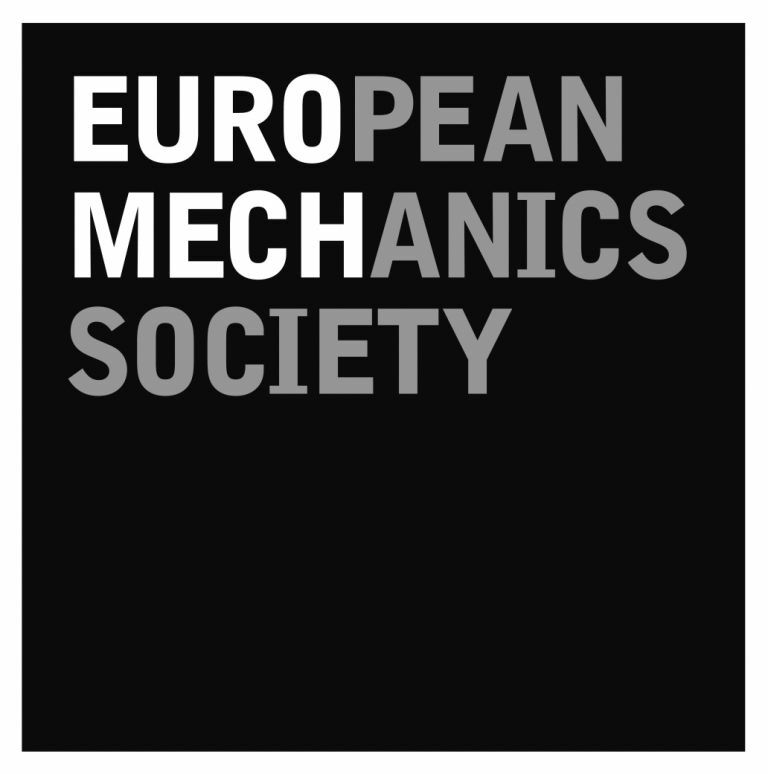 ETC is the main European conference on turbulence and related topics. Attracting about 500 participants from many different countries, ETC offers since 1986 a top-level platform for scientists to deliver cutting-edge presentations. The conference agenda includes keynotes, plenary presentations, oral communications and social activities. 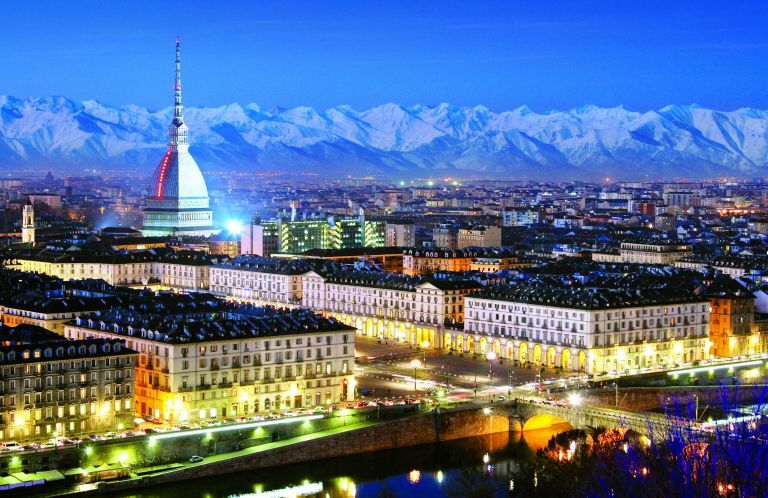 The 17th ETC will be held in Torino, one of the most attractive and dynamic Italian cities. 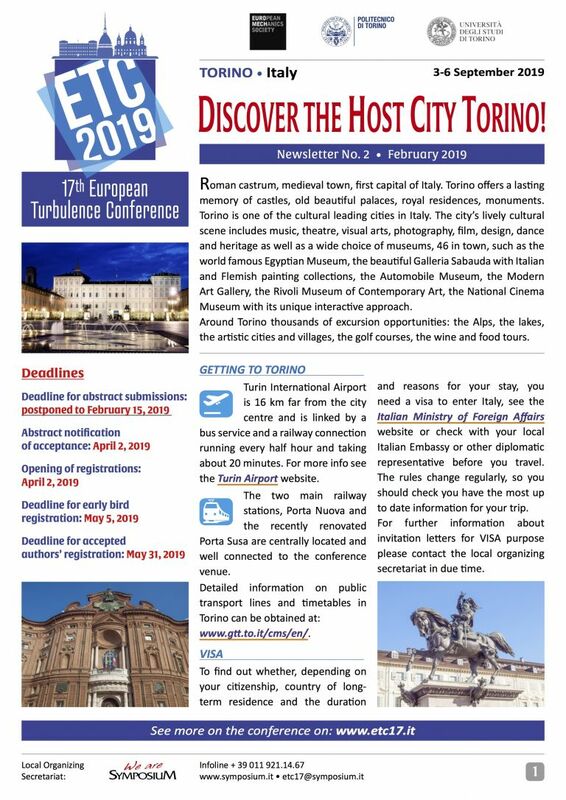 Abstracts for the 17th European Turbulence Conference in Torino can be submitted via the online system. Abstracts must be submitted according to the submission instructions uploading only a PDF version produced from the Word or LaTex conference templates. Templates as well as detailed information on the submission rules and procedure are available on the online submission system. - on-site registrations will be subject to availability. Reduced registration fees do not include social dinner. There will be no penalty for registration cancellations received 90 days before the first day of the conference. The full amount paid minus a processing fee (20 Euros) and wire transfer or credit card costs will be refunded. A cancellation fee of 50% of the full registration fee plus a processing fee (20 Euros) and wire transfer or credit card costs will be applied for cancellations received between 89 to 45 days before the first day of the conference. A cancellation fee of 75% of the full registration fee plus a processing fee (20 Euros) and wire transfer or credit card costs will be applied for cancellations received between 44 to 20 days before the first day of the conference. No refund will be issued for cancellations received less than 20 days before the firstday of the conference (September 3). All cancellations must be sent in writing via e-mail (etc17@symposium.it) to the conference secretariat. Cancellation confirmation will be sent within one week. The conference organising committee and secretariat are not responsible for problems beyond our control such as weather conditions, public order issues, strikes, etc. No refunds will be given in these situations. No reimbursement will be made for late arrival, unused services, unattended events or early departure from the congress. The final decision on refunds rests with the ETC17 conference organizers. All refunds will be made within 30 days after the conference ending. When you register for the conference, you will be confirming that you have reviewed and understood this conference registration refund policy. insurances. The conference organization does not cover individuals against cancellation of bookings, theft or damage to belongings. All best endeavours will be made to present the conference programme as published. However, the conference Organizing Committee and the Secretariat reserve the right to alter or cancel, without prior notice, any arrangements, timetables, plans or other items relating directly or indirectly to the conference, for any cause beyond our reasonable control. The conference Organizing Committee and the Secretariat are not liable for any loss or inconvenience caused as a result of such alteration. 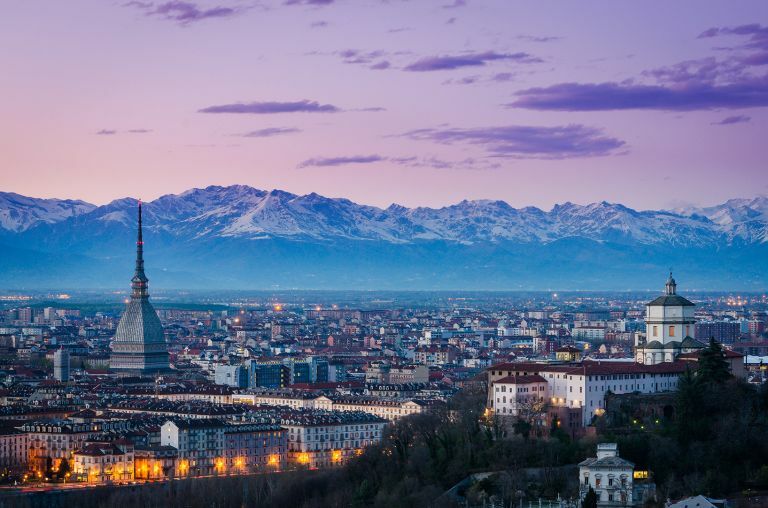 Torino lies in the centre of Europe and takes advantage of a well structured connection system by plane, train and car. Caselle International Airport (www.aeroportoditorino.it), 20 minutes away from the city centre, allows daily connections with the main European cities. Moreover Malpensa International Airport (www.milanomalpensa1.eu/en), one of the main European hubs connected to more than 120 cities all over the world, is located only 60 minutes' drive from Torino. 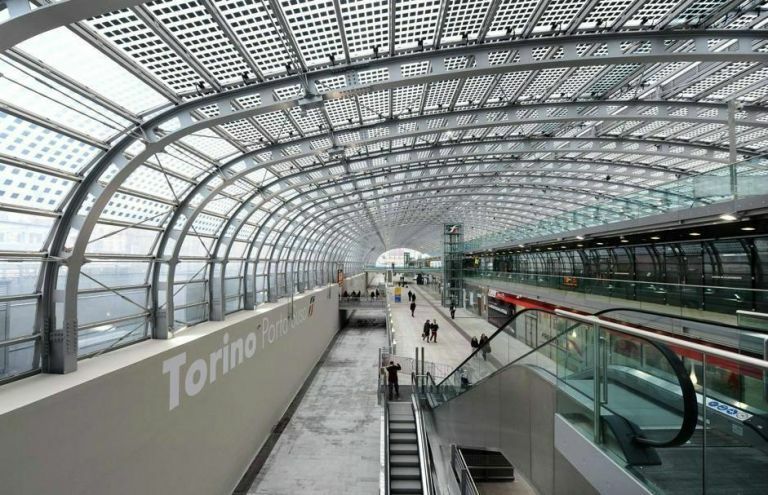 Torino has two main railway stations, Porta Nuova and Porta Susa, both in the city centre. They are connected, also with frequent high speed rail services, to the main destinations in Italy and France, and from there to the rest of Europe. Lyon can be reached in 2.5 hours, Paris in about 5 hours and Milan in only 50 minutes. Motorways A6 Torino-Savona, A4 Torino-Milan-Venice, A21 Torino-Piacenza-Bologna, A5 Torino-Aosta, A32 Torino-Bardonecchia connect Torino to most Italian cities, to France, Switzerland, Austria and the rest of Europe. Torino Metro line service usually runs from 5.30 until 00.30 except at weekends (until 01.00) and on Mondays (until 22.00). Taxi are readily available at the taxi stops or calling 0115730-0115737. 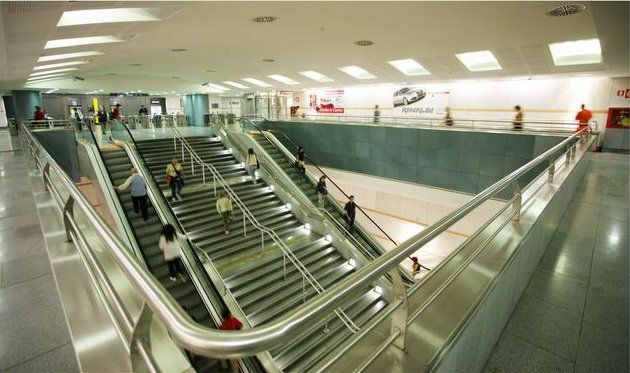 The Politecnico can be reached from the city centre in a few minutes by subway (Vinzaglio metro station). Ticket cost: € 1,50. Roman castrum, medieval town, first capital of Italy. Torino offers a lasting memory of castles, old beautiful palaces, royal residences, monuments. Torino is one of the cultural leading cities in Italy. The city’s lively cultural scene includes music, theatre, visual arts, photography, film, design, dance and heritage as well as a wide choice of museums, 46 in town, such as the world famous Egyptian Museum, the beautiful Galleria Sabauda with Italian and Flemish painting collections, the Automobile Museum, the Modern Art Gallery, the Rivoli Museum of Contemporary Art, the National Cinema Museum with its unique interactive approach. 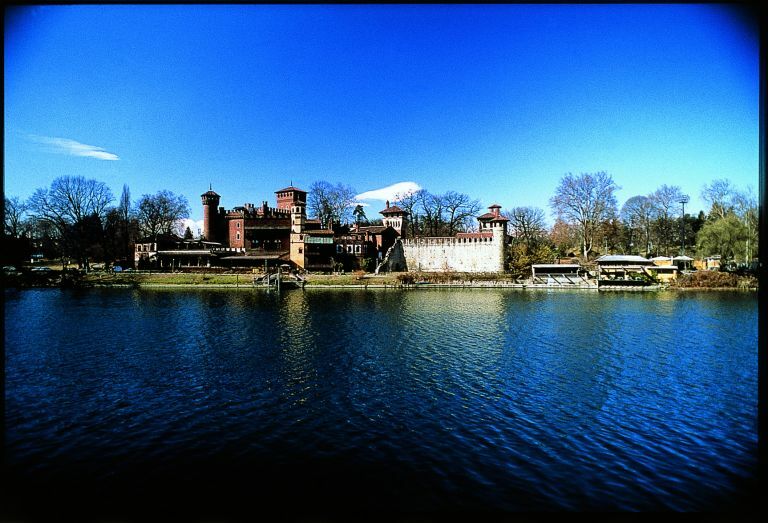 Around Torino thousands of excursion opportunities: the Alps, the lakes, the artistic cities and villages, the golf courses, the wine and food tours. Torino offers both luxury and characteristic shops. Most of the luxury shops are located in the city centre on via Roma: fashion boutiques, jewelry shops, perfume shops and food and wine stores which feature the best of the regional products. Then there are the characteristic shops in the little alleys of the inner city, full of cafes and craftshops. Torino has a little bit (or, as is often the case, a lot) of everything and for all budgets as well. Torino is one of the undisputed world capital of taste. It has always boasted a renowned food and wine tradition. The region’s extraordinary cuisine can be enjoyed in over 600 city restaurants. Restaurants are usually open from 12.00 to 14.30 and from 19.30 to 22.30. For those who prefer something different to the classic menus, Torino proposes a most pleasant alternative: wine bars. Torino is also renowned for the ability of its pastrycooks. Located in the north-west of Italy Torino has a continental weather, which is usually mild in September. Average temperatures range from 17°C to 27°C. To find out whether, depending on your citizenship, country of long-term residence and the duration and reasons for your stay, you need a visa to enter Italy, see the Italian Ministry of Foreign Affairs website at www.esteri.it/visti/index_eng.asp or check with your local Italian Embassy or other diplomatic representative before you travel. The rules change regularly, so you should check you have the most up to date information for your trip. Torino offers a wide choice of hotel accommodations. The conference organization has selected some of the best hotels in the city. Attendees can book their rooms via the online reservation system. Attracting about 500 scientists from all over the world, ETC will provide an important forum for companies to showcase their latest technologies, products and services. The conference supporting opportunities will include various levels of support and diverse promotional solutions for all budgets. You will have a rare opportunity to showcase your organization to some of the most influential individuals in the field. ETC provides an excellent forum for your company's marketing and educational needs. For detailed information DOWNLOAD the conference supporter and exhibitor prospectus . For any further clarification please apply to the conference organizing secretariat. The first ice-breaking social event will be the welcome cocktail reception to be held on Tuesday September 3 at the conference venue. A good occasion to meet old and new colleagues in a nice, relaxing atmosphere. 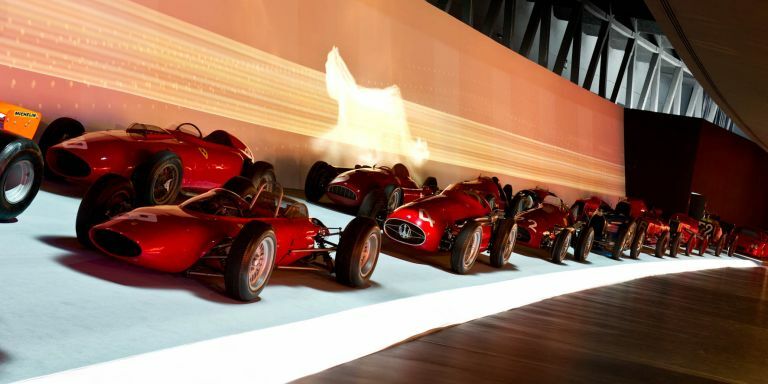 The main social event will be the social dinner scheduled on Thursday September 5 at the Museo Nazionale dell'Automobile (National Car Museum), a fascinating, interactive museum which was recently renovated with a modern, innovative design. A real architectural work of art. A jewel for all car lovers. Attendees will discover one of Torino's most interesting cultural and touristic sites (visit to the Museum before dinner is included) and enjoy the well-known Turin food and wine tradition. Bus transfer service from the conference venue will be provided. The social dinner is included in full-fee registrations. Requests will be accepted up to the venue maximum capacity (500 people). Participation fee: € 120,00 VAT included. Registration via the online registration system. The 17th ETC will be held at the Politecnico di Torino, corso Duca degli Abruzzi 24, Torino. Conference facilities will be located both at the Politecnico main campus (pedestrian access at corso Duca degli Abruzzi 24) and in the new campus called Cittadella Politecnica (pedestrian access at Corso Castelfidardo 34/a) situated at a few minutes minutes' walking distance from the main building. Plenary sessions will be held at the Aula Magna, the main university conference room located in the Politecnico main campus. 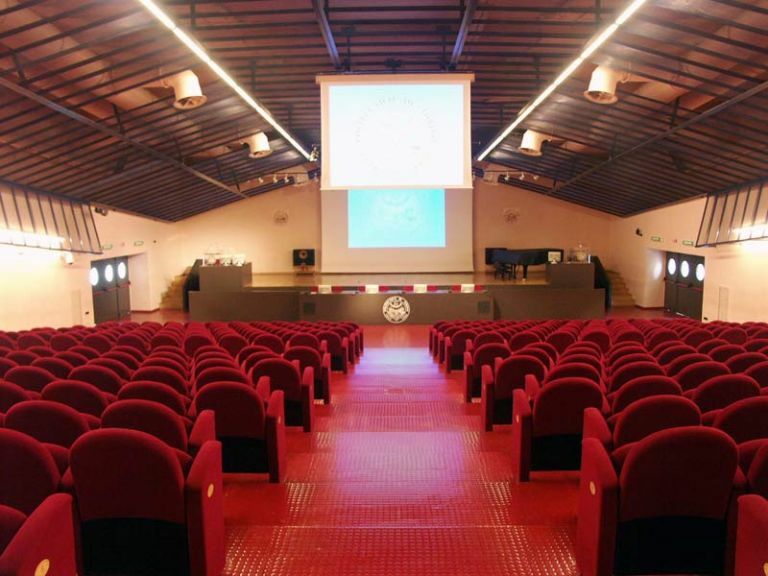 Parallel sessions will take place in the Rooms I, modern teaching rooms located in the so-called Corte Interrata building of the Cittadella Politecnica. This web site is owned and operated by Symposium srl, the company in charge for the organizing secretariat of ETC 2019 in cooperation with the Local Organizing Committee. The term "Site" as used in these Terms and Conditions refers to this web site and its contents, including any information, ideas, text, graphics, designs, photographs, organization, layout, functions, coding or other materials. This Site is provided for general information purposes only. It should not be used or relied on to obtain any answers to any technical questions. Any use of this Site, including any reference to it, is made subject to these Terms and Conditions, and any person accessing, browsing or using this Site, or any portion of it, does so solely in accordance with these Terms and Conditions. 2.You hereby warrant and represent to the ETC 2019 conference organizing committee and Symposium srl that you will not use the Site or any part thereof without the express prior written consent. 4. 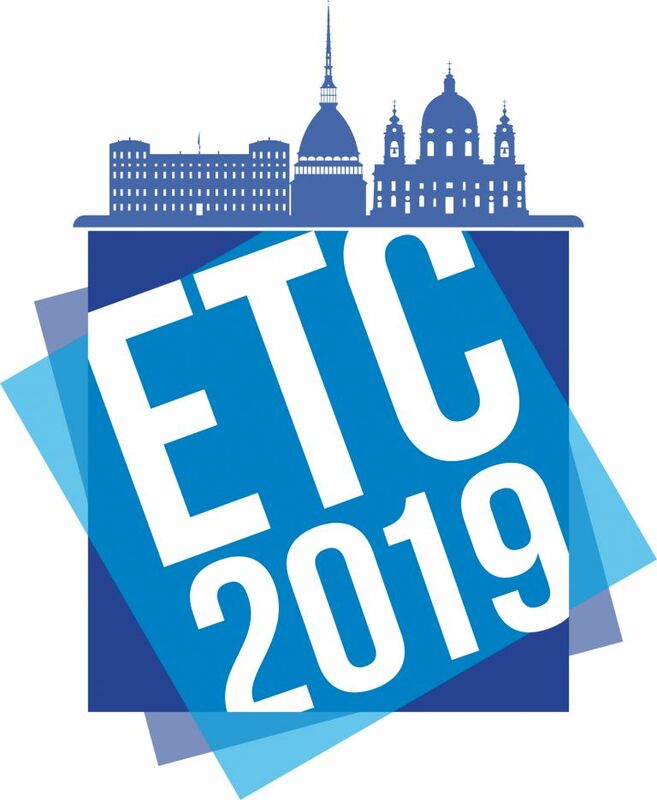 The ETC 2019 conference organizing committee and Symposium srl may, at their sole discretion, modify or revise these Terms and Conditions at any time by posting these changes online and without notice. Your continued use of this Site after any such changes have been posted constitutes your acceptance of these Terms and Conditions as modified. The Site has not been written to meet any individual or specific requirements and is intended to provide general information on the conference only. As such, it should not be relied on or considered as a substitute for any advice. The ETC 2019 conference organizing committee and Symposium srl do not accept any liability to any person or organization resulting from the use or reliance of any information contained on this website. Any sites linked to this Site may not be assumed to be under the control or custody of the ETC 2019 organizing committee and Symposium srl. The inclusion of any link or hyperlink to or from this Site does not imply a recommendation or endorsement of that link or site or any information contained therein. Any links to other sites are intended solely as a convenience to the visitor and no responsibility for or representations may be assumed, or any obligation to monitor the contents of such linked sites may be inferred. This Site may include copyrighted materials, such as literary and artistic works in the form of animations, photographs, graphics, images, videos, text, music, and sounds, database rights, and may contain registered trademarks, or design rights belonging to the ETC 2019 conference Organizing Committee and Symposium srl or any third parties ("Proprietary Rights"). You are not authorised to use, copy of disseminate any materials from this Site without the express prior written permission of the ETC 2019 conference Organizing Committee and Symposium srl and any third party who may have Proprietary Rights in such materials.